Earthworks and other fringe environmental activist groups can’t seem to take a hint when it comes to oil and natural gas development in Ohio, and the result is an ever-growing list of failed Buckeye State anti-fracking events. This past weekend’s “Community Informational Forum” in Belmont County, one of the highest natural gas producing counties in the state, was a perfect example of what we see day in and day out in Ohio — the perception of the anti-fracking echo chamber has no basis in reality. While EID’s continued coverage of these failed events may seem redundant, it demonstrates the inability of fringe activists to gain any traction in the Buckeye State. More importantly, with this specific case we see a perfect dichotomy between what’s actually happening in Belmont County in real life as compared to the alternate reality activists want their social media followers to believe exists. 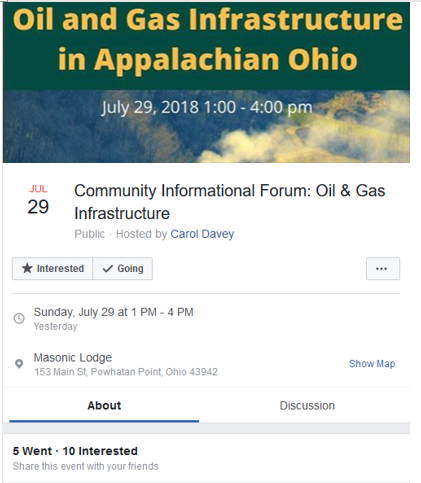 For example, even though there was significant advertising in advance of the “Community Informational Forum” in the echo chamber of anti-fracking groups on social media, almost nobody showed up. As the Facebook page for Sunday’s event shows and eye-witnesses reported to EID as well, only a handful of people turned out for a three-hour presentation by Earthworks, the Ohio Environmental Council, the Southwest Pennsylvania Environmental Health Project, and the Ohio Valley Environmental Coalition. Meanwhile, actual community members have had a lot to say about both XTO Energy and the budding petrochemical manufacturing rebirth in the region. But don’t take our word for it. Here’s what real people in Belmont County — who actually live and work there — say about XTO Energy and shale development in Belmont County writ large. “The Rev. Michael Ziebarth, who has said the county, related agencies and XTO must use this incident as an opportunity to look more closely at safeguards and response issues to prevent future accidents, said XTO’s response to the well pad explosion was beyond reproach. According to the Intelligencer, that response included paying for food and lodging for displaced families, working with local businesses to replace lost wages and revenue, buying generators in case of power outages as evacuated families returned home, and setting up a claims department hotline for impacted residents and businesses. In fact, just days after Earthworks’ failed Belmont County event, XTO Energy donated $25,000 to the Belmont County Emergency Management Agency to help advance the safety and security of local families in the region for years to come. There is a reason that anti-fracking event after anti-fracking event has failed to draw crowds in the Buckeye State – the doom and gloom scenarios that these groups describe and thrive on aren’t coming to fruition after nearly a decade of shale development. What has shale done? Renewed the hope of a region formally known as the Rust Belt by creating jobs, generating tax revenue and spurring new investments. It’s been a game-changer that, if these failed events are any indicator, the folks who actually live here can clearly see.